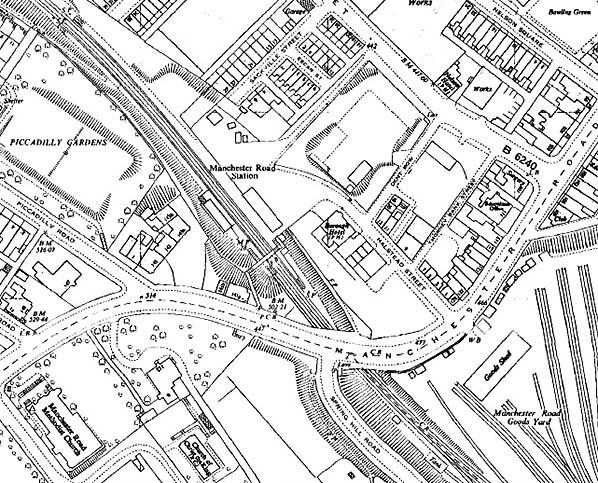 Notes: The first station on the Copy Pit route to serve Burnley was sited immediately south-east of Manchester Road. It was briefly the western terminus of the route when it opened on 12 November 1849 but in August/September 1850 the line was extended the short distance to Gannow Junction, allowing trains to run to Rose Grove and beyond. The station is commonly referred to at Burnley Thorneybank, although the OS plan of 1851 calls it Manchester Road. A station building of substantial size was on the up (north-east) side of the track, and the 1851 plan indicates that although a double-track railway passed through the station, only an up platform was provided on a third track that ended at the road bridge. As befitted the principal intermediate on the Copy Pit route, Burnley was provided with an engine shed and extensive goods facilities. Unusually, the goods warehouse / shed was aligned at right angles to the through railway, and this arrangement was made possible because the LYR favoured the use of wagon turntables, enabling wagons to be turned at 90° rather than having to negotiate longer sidings with short-radius curves; it was essentially a space-saving device. The February 1863 Bradshaw timetable shows a service at irregular intervals, and this continued to be a feature of the route throughout its first life of 1849-1965. The timetable calls the station Burnley (without the addition of ‘Thorneybank’ or ‘Manchester Road’). This station was to have a short life as a passenger facility because in 1866 it was replaced by the LYR with a station on the opposite (north-west) side of the Manchester Road bridge. However goods traffic continued to be handled on the south-eastern side of the bridge. The original passenger station was demolished before the end of the nineteenth century. East Lancashire Railway’s 2-4-0 No.33 ‘Mazeppa’ is seen adjacent to the engine shed at Burnley Manchester Road station’s first site (Thorneybank) probably in the early 1870s; the shed, with the tank on its roof, is seen far right. 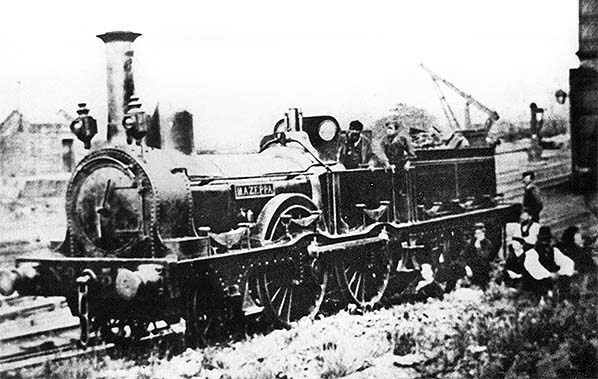 The loco was built by Walker Bros in 1849, and was a member of what has been described as the largest and smartest class of locomotives on the Lancashire & Yorkshire Railway. This photo was taken prior to the transfer of ‘Mazeppa’ to Low Moor shed in the late 1870s. 1959 1: 1,250 OS map. Almost a century after the passenger station south-east of Manchester Road closed to passengers ‘Manchester Road Goods Yard’ is still in business, and over a dozen sidings fan out on the up side; the goods shed is still in place and named, but the canal-side warehouse is no more. There has been some rationalisation of the passenger station with the removal of the platform awning from in front of the main building. The map is not strictly accurate because a shorter awning had been installed in its place in 1950 and is known to have survived until the early 1970s. By the time of this map the station’s use has declined and it will close to passengers in November 1961, but goods will continue to be dealt with until April 1973. East Lancashire Railway’s 0-6-0ST No.622 ‘Atlas’ is seen close to the engine shed at Burnley Manchester Road’s first site (Thorneybank) prior to the engine’s demise in 1898. The engine shed was unusual in having a water tank mounted on its roof. It is not known when the shed closed, but it must have been by 1899 when the large Rose Grove shed opened less than two miles away. 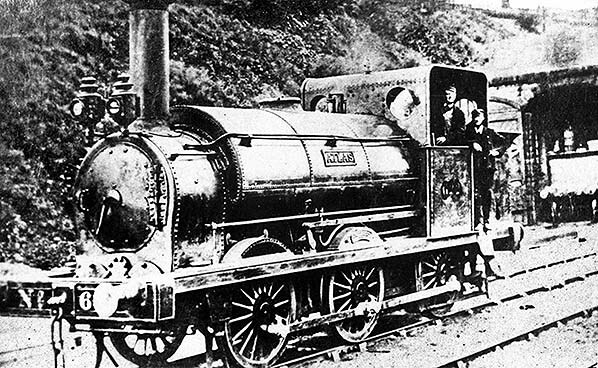 The first locomotive of this class was built in 1868 and ‘Atlas’ was one of six built in 1875 allocated to the ELR section which were given names carried by withdrawn locomotives. 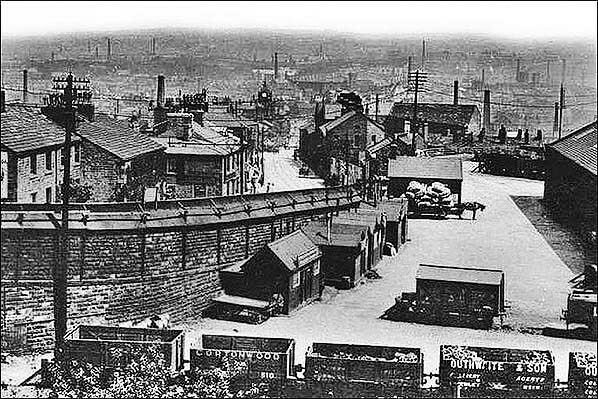 Looking north-east towards the site of the station building at Burnley Manchester Road (1st, or Thorneybank) station c1910. The building stood immediately beyond where the rake of coal wagons is parked, and after closure to passengers in 1866, it was demolished; the exact date of its removal is not known, but it no longer appears on OS maps of the 1890s. 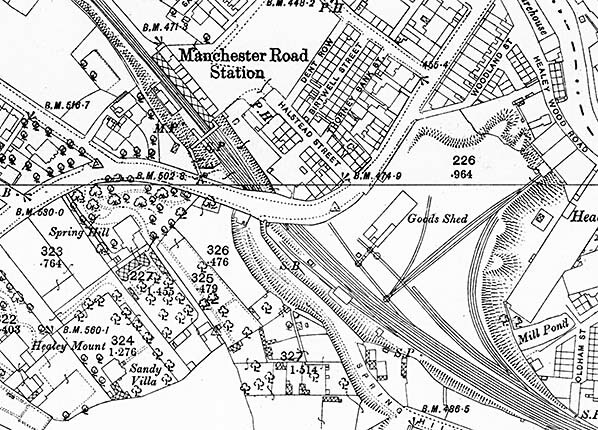 The goods and coal yard continued to operate on the first station site after passenger facilities were relocated north-west of Manchester Road bridge. The goods warehouse is on the extreme right, aligned at right angles to the through railway, as it was originally reached by sidings equipped with wagon turntables – as will be seen on the accompanying large-scale OS map of 1851. Beyond the row of sheds, the nearest of which is probably a coal office, a horse is recovering having drawn a heavily laden cart into the yard. The coal wagons carry private owners’ names, including Cortonwood Colliery (Barnsley). 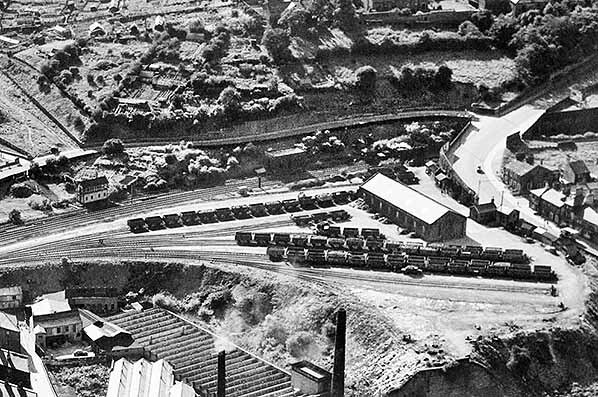 This oblique aerial view is looking west over the goods yard of Burnley Manchester Road station in September 1951. The passenger station, both in 1951 and 2016, is just off the right-hand edge of the photo. Structures of interest are Manchester Road signal box and, to its right, the long-disused engine shed – both on the far side of the double-track Copy Pit route - and the goods warehouse (the largest building on the photograph) aligned at right angles to the railway. Most of the sidings in the goods yard are occupied by mineral wagons. The building of the first Manchester Road passenger station, also known as Thorneybank, was located immediately left of the bridge, beyond the goods warehouse; after the station was relocated on the opposite side of the bridge the building was demolished. 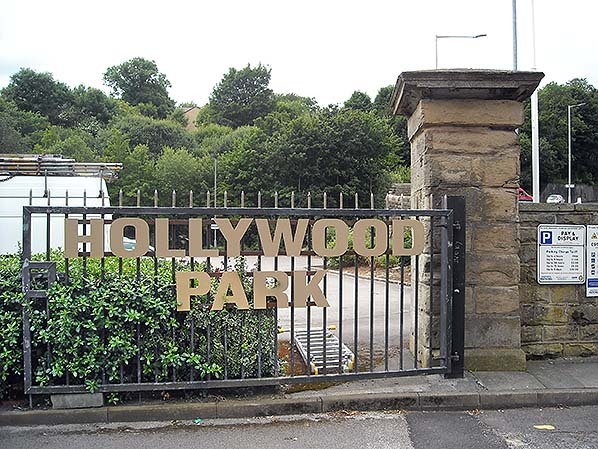 After the goods yard closed its site was redeveloped for leisure use, including a multiplex cinema. 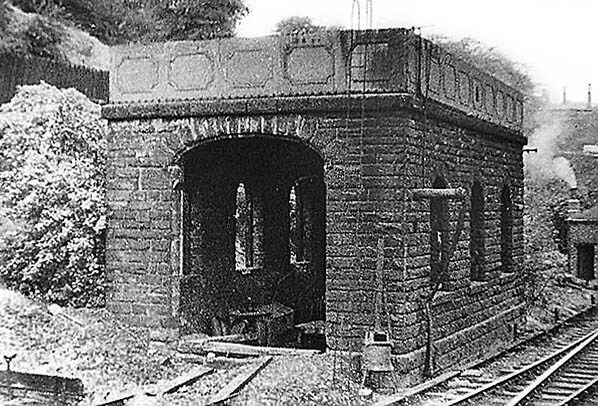 A single-road ‘tank’ engine shed was provided at Burnley Manchester Road (Thorneybank), probably from its opening, to house the Burnley Branch locomotive used on the passenger trains; for a short time until the connection was built to Gannow Junction it was a true branch. Sometime after the amalgamation with the East Lancashire Railway in 1859 and the building of the Stansfield Hall to Hall Royd curve, opened 1862, whatever engine was used was too big for the Manchester Road shed, or because the trains now started from Rose Grove and passed through the new Manchester Road station it was probably abandoned as an engine shed but used for other purposes. Exactly where locos were stored / maintained / prepared in the Burnley area before Rose Grove shed opened in 1899 remains a mystery; there was nowhere nearby that was big enough and nothing appears on maps. Accrington was the nearest stabling point that is known about. The former shed remained in place for many years, as seen on this photograph from 1957, and it was still in place, with a track leading into it, as late as July 1967. Its date of demolition is not known. The first site of Burnley Manchester Road station, looking south-east from Manchester Road bridge in August 2015. Nothing remains of the station. 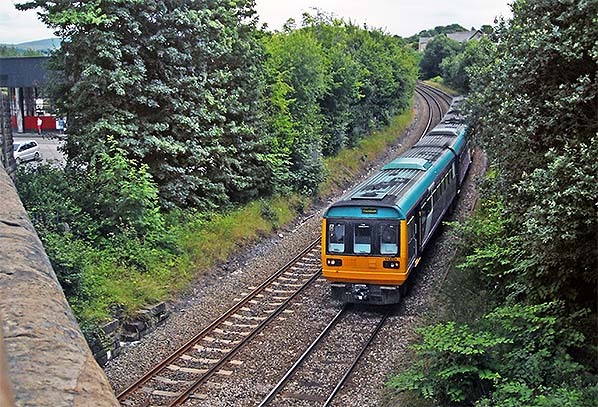 On 21 July 2016 Class 142 ‘Pacer’ No.142 031 is passing the first site of Burnley Manchester Road station and is about to stop at platform 1 of the current station. Nothing remains of the first station. 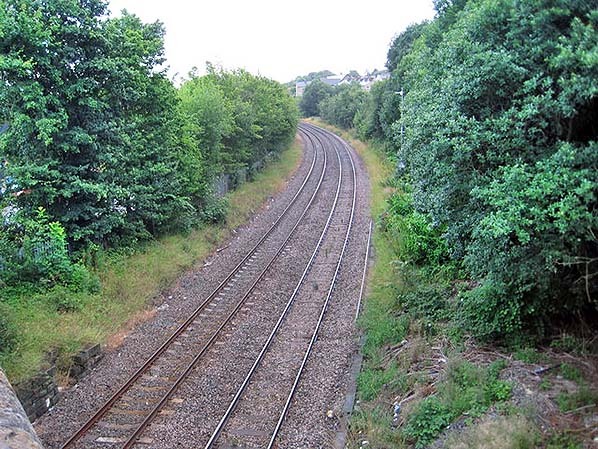 This train is operating the year-old direct service from Manchester Victoria to Blackburn via the ‘Todmorden Curve’. The view is south-eastwards from Manchester Road bridge. Looking south-west in July 2016 towards the site of Burnley Manchester Road (1st) passenger station’s building; it stood about 40yd ahead. The goods warehouse stood to the left, off the picture. Nothing remains of either structure. The site ahead is the car park for a leisure complex including a bowling alley and a multiplex cinema. Burnley Manchester Road goods station was on the opposite (south-east) side of Manchester Road from the current station. 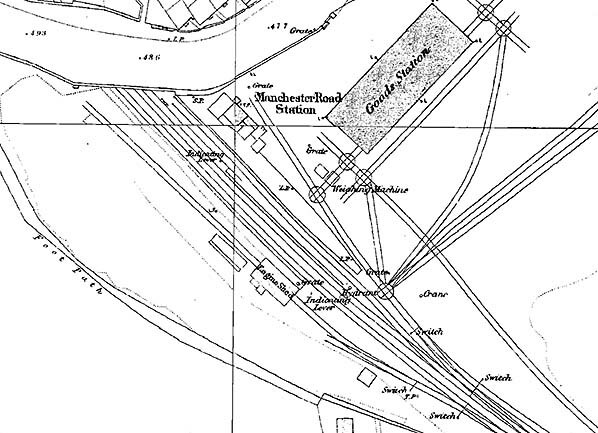 Until 1866 the first Manchester Road passenger station was adjacent to the goods station. Goods were handled until 1973. 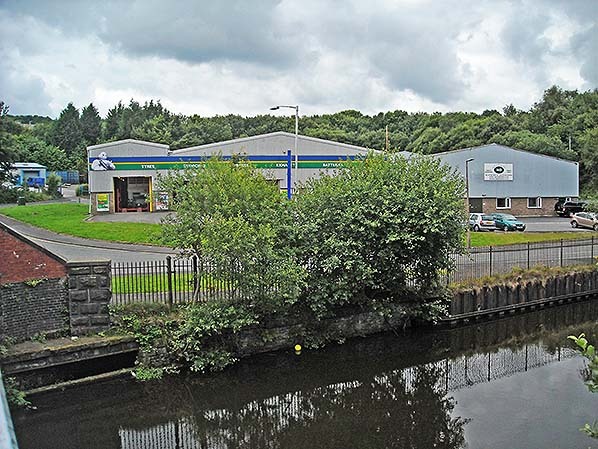 This view, looking south-east across the Leeds & Liverpool Canal shows modern industrial units on the site of the goods yard. 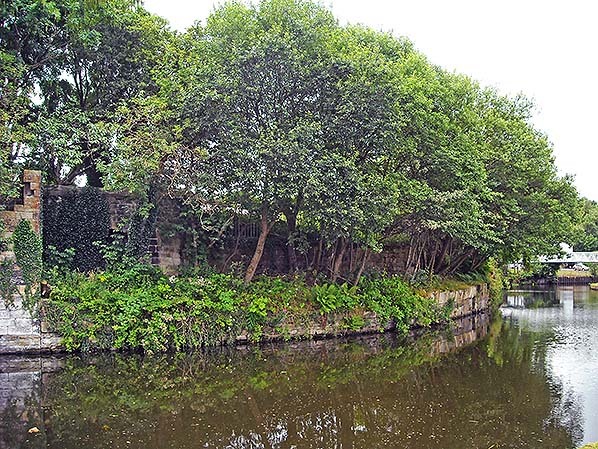 Burnley Manchester Road goods yard included a short branch to a warehouse on the bank of the Leeds & Liverpool Canal. This warehouse stood towards the right on this southward-facing photo of July 2016. Nothing remains of the structure.